Santa Claus needs help - it would seem that the Christmas spirit isn't as rife as it once was. We've become too jaded, too cynical to see the magic of the Yuletide season. We don't believe like we once did and Saint Nick needs our faith to make his sleigh fly once more. Yet, if there's one film that can really inspire goodwill to all men and seasonal glee, a movie which can really power the Claus-o-meter, it is Elf; a picture which became and instant staple of Christmas tradition. No holiday festivities would now be complete without stockings, a warm fireplace and Buddy the Elf asking: "What's your favourite colour?" 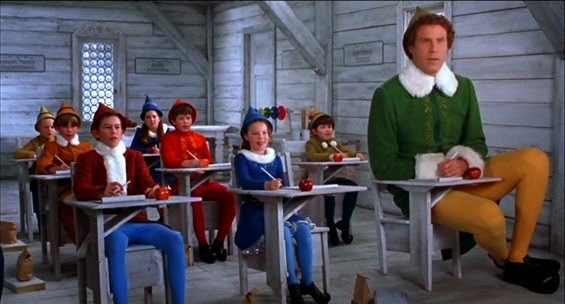 Will Ferrell, in a career-best performance, stars as Buddy - a human raised as an Elf in the North Pole. He towers over his peers and struggles with the ways of elf-dom; the intricacies of assembling Etch-A-Sketches belies the fact that, perhaps, he doesn't belong. It is up to a beleaguered Santa (Ed Asner) to break the truth to our gangly hero - Buddy's biological Dad, a human, lives in a far away land called New York and, even worse than this, is on the dreaded "naughty list". Buddy takes this information and sets out, past the seven levels of the Candy Cane forest, through the sea of swirly twirly gum drops, and then through the Lincoln Tunnel to find his father and, ultimately, his own place in the world. The joy of Elf is presented to us as the ultimate culture clash - a dispirited New York, decked out in ostentatious dressing (a celebration as much to capitalism as to Christmas), comes face-to-face with a joyous, earnest force of nature in the ever cheerful Buddy. His father, a dour James Caan, is perplexed by Buddy's unrelenting enthusiasm and considers him mentally ill, his happiness an affliction which can be cured - yet, as is often the case, perhaps it is the unusual outsider we can all learn a lesson from. Elf shows us how love, and belief, will always triumph over cynicism and apathy. 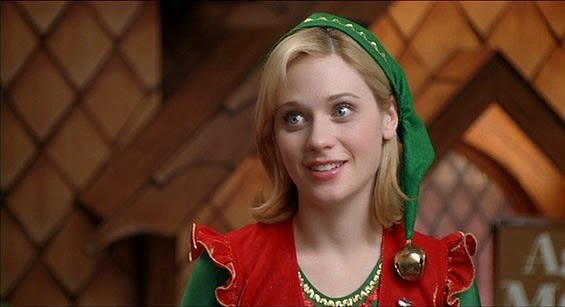 Buddy, and his enthusiasm for spreading cheer, touch those around him as his splendorous happiness proves contagious - Jovie (a charming Zooey Deschanel), finds herself oddly wooed by an adult male who dines almost exclusively on sugar and dresses in elf-costumes at all times. Buddy, however, only sees the best in the world and in the people he meets - and it is when life is reflected through Buddy's eyes that Jovie finds happiness in her heart; his felicity inspires those around him to feel the same too. Buddy provides the single spark New York needs to set itself ablaze with Festive cheer. A triumph of good-nature, Jon Favreau's movie is a masterpiece of seasonal film-making. Laugh out loud funny and muffled-tear touching too, Elf is a Christmas gift which keeps on giving.